An exceptional and exquisite 14k white gold bracelet, beautifully made using an anchor linked chain which is set with stunning pear shape light doublet opals, sourced from quality opal mines in Coober Pedy, South Australia. A beautiful example of designer opal jewellery. 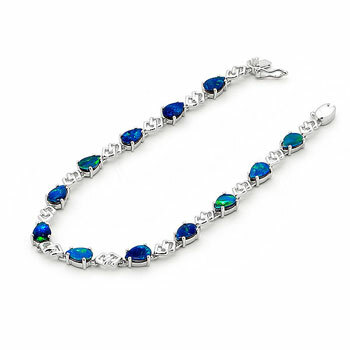 The interplay of colour of the opals of this bracelet makes this piece a unique addition to any jewellery collection.